Join us for a live, online webinar using Zoom. Tickets to class include the recording which can be viewed online or downloaded to watch at your convenience. All Fly-In recordings are available for purchase in the Tutorials section below. Our last Fly-In was Degree of Separations, an Embird Editor class. It started in January 2019 and had 2 live sessions. Click HERE for more information on the class and links for purchasing the video tutorial. Everything Embroidery and Vinyl Tradeshow Owensboro, KY.
No seminars (face-to-face classes are scheduled at this time. But you can help schedule one! Subjects include Manager, Editor, Studio, Embird Alphabets, and Font Engine. I do not teach Cross Stitch or Sfumato. I have several groups where you can receive free help on the Embird program - two are on Yahoo Groups and one is on FaceBook. I also have two groups dedicated to information about my classes. One is a discussion group, and one is for notices only. Both are on Yahoo Groups. I have been using Embird for over 14 years and absolutely love it. I am an independent instructor. I don't sell Embird. I have no affiliation with the Embird company. I have permission to use their program and screenshots of it in my tutorials. I do not receive any compensation from them for my time and expenses on any classes or groups. 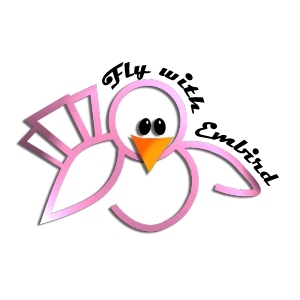 I really enjoy helping others learn to use Embird so they can have as much fun with their embroidery hobbies/businesses as I do.